…you would have been in for a big surprise. My friend C is currently taking a photography course and she decided that Leigh Woods would be the prefect destination for a quirky shoot. That’s why on Sunday afternoon I was hauling a bag of jewellery, masks and other such props through the woods along with C and several of her friends, dressed in capes, Sgt. Pepper style jackets and boating hats. We certainly raised a few eyebrows amongst the families, walkers and cyclists enjoying a quiet Sunday stroll. 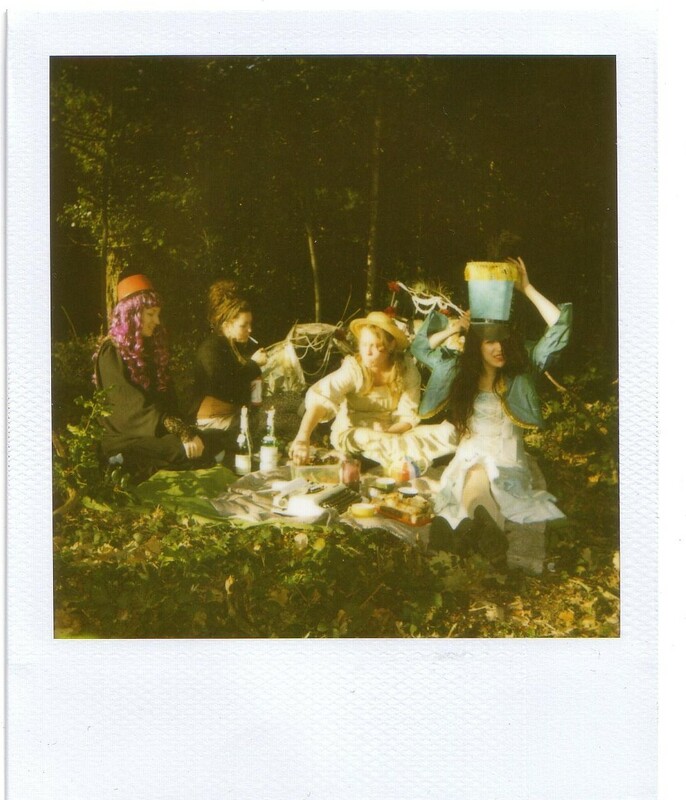 I can’t give away too much about the shoot as C was working with film and hasn’t yet developed her photos but above is a Polaroid I took of the quirky characters enjoying a mad hatter style tea party. Bristol listen up. 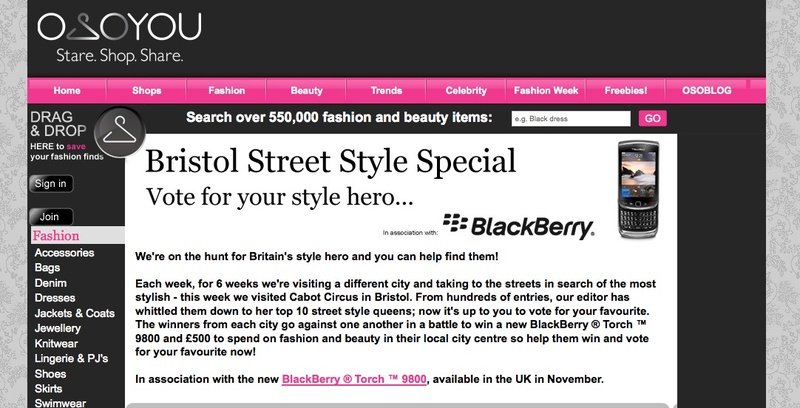 Your fair, fashionable city has been shortlisted as one of the style capitals of the UK on OSYOU.com. Obviously you and I know that Bristol is a fashion-forward city that could rival London or Manchester, and now we have a chance to prove it. Last Thursday the folks behind high-street fashion website OSOYOU came to Cabot Circus to find and photograph the best of Bristol. Unfortunately, as they picked a weekday, I think they missed out on capturing many of Bristol’s stylish residents but they did find some cracking shop workers and students, see below. I particularly like Amie’s look, above, with that gorgeous blush pink skirt and blouse combo – it’s like the lovechild outfit of a prim and proper librarian and a rockabilly Gucci model. If you missed out on the event itself the fear not as you can still vote for your favourite Bristol gal to win, earning her some new threads and Bristol its rightful title of most stylish city. You can go straight to the voting page for Bristol here. My money is on Amie but what does everyone else think? My (soon to be) in-laws have been having a belated spring clean of their house and garage recently, which resulted in several boxes of the boyfriend’s belongings turning up at our flat, competing for floor space against books, furniture, bags and whatever else gets thrown on the floor when I walk through the door. To cut a long story short, the boyfriend inherited the task of dealing with his grandparents house after they passed away a few years ago and so it was that we found ourselves on the living room floor, sorting through boxes of stuff he had decided to keep at the time. While he tackled military memorabilia, I was trusted with the task of trawling through 50 odd years of photographs. 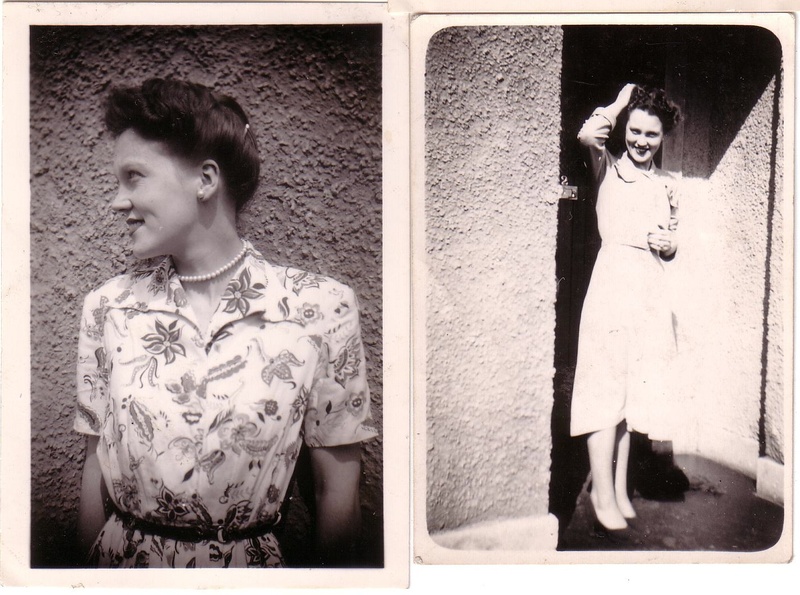 As something of a photography fanatic, I was delighted to see everything from Polaroid snaps in the 70s to tiny, passport photo-size snaps from his grandparents in the 1940s. M’s grandmother Christina used to be a model and the snaps that you can see here are ones her husband took of her throughout the years. This was long before the age of digital photography and yet there were literally hundreds of images like this of Chris posing on holiday, outside their home and with her friends. There were shots of her taking part in modelling competitions and on holiday in a kaftan Ossie Clark would be proud of. One of the things I love about fashion, blogging in particular, is how important street style and different sub-cultures have become. Outfit posts are so common these days and while there are some blogs out there that excel at this (The Satorialist and What Katie Wore, for example) there are also many bloggers out there that deliver half-hearted attempts. I include myself in this majority, which is why you won’t often see me posing in my new threads. However, when I look at all the images of what were effectively outfit posts for a different generation, I am inspired by the relationship between subject and shooter. Some shots are candid, some staged but in each Chris has that glamorous appeal that I associate with this era. 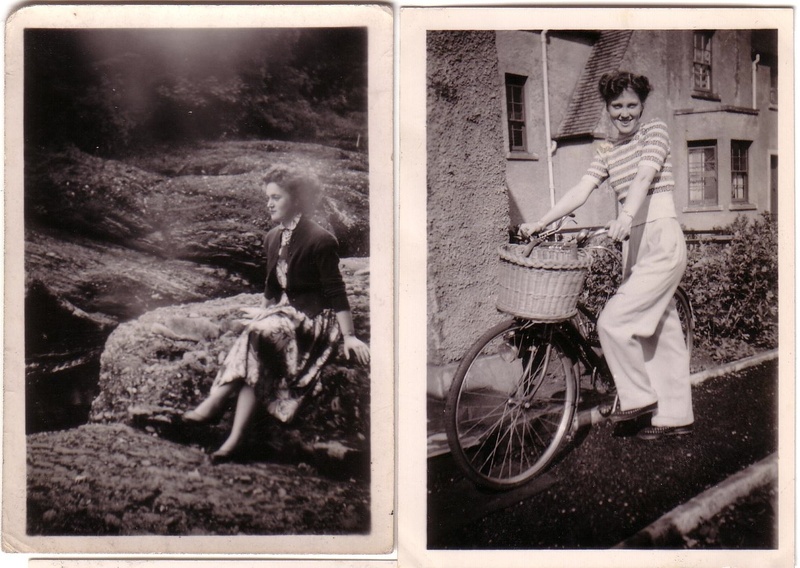 Fresh faced but with immaculate hair, fitted outfits and simple accessories, these images could appear on any vintage fashion blog today. Although fashions and models of camera changed over the course of 50 years, her knack of style and her husband’s love of photographing her remained the same. 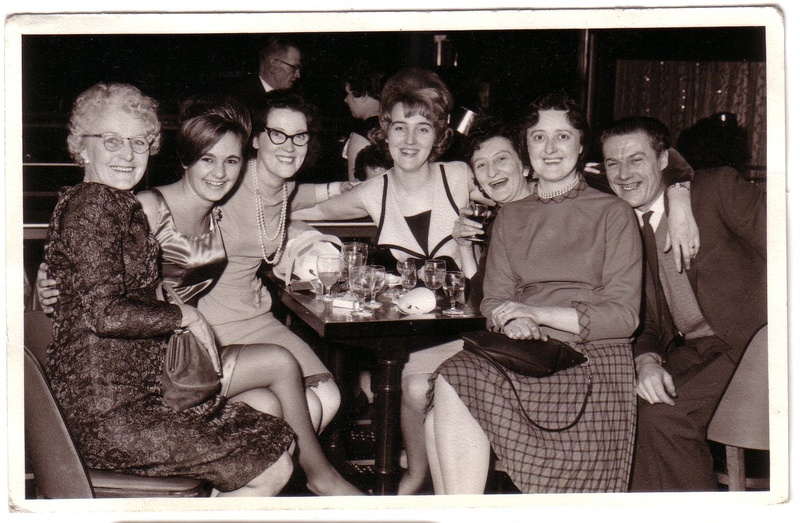 I wish I could have been around to experience such important decades of fashion and photographic developments but for now I’ll settle for seeing them through the lens of M’s grandfather. I spent the afternoon with S in Broadmead and Cabot Circus, searching in vain for a decent pair of brogues to take my feet from summer to autumn and yet again I drew a blank. 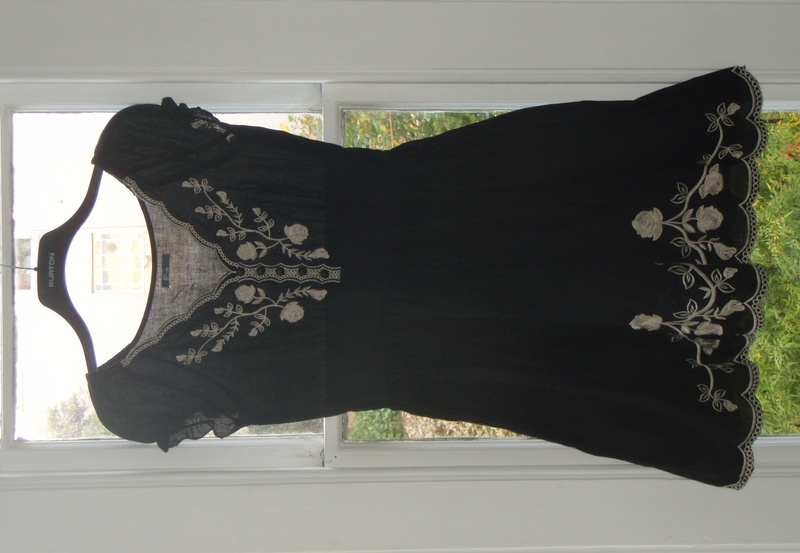 I did however, stumble across this delightful black dress, above, in the Peacocks sale. With ruched puffball sleeves and a scallop hemline it isn’t perhaps the most practical of purchases I could have made in October but I just couldn’t resist. 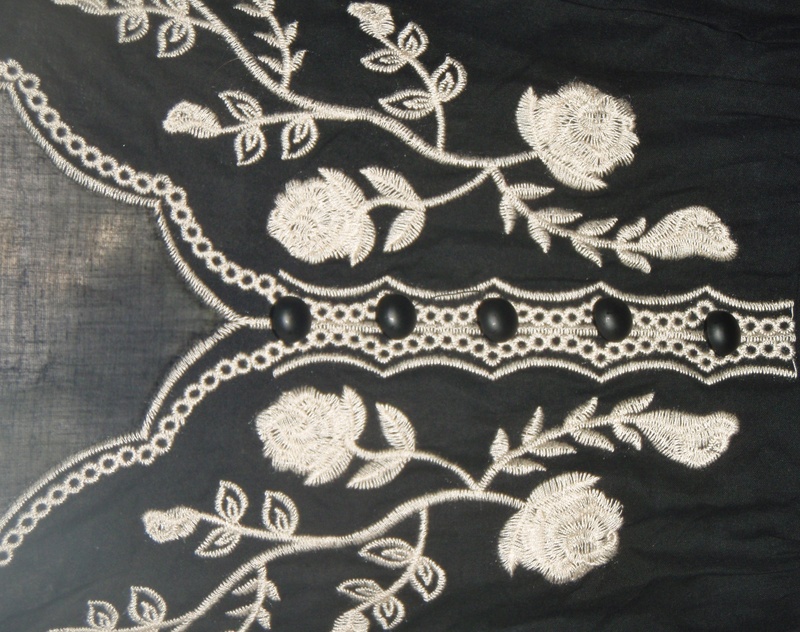 The scallop details and rose embroidery are very well finished and the shape – is very Little House on the Prairie. If I had found this £10 gem a couple of months ago it would have been worn with bare legs and gladiator sandals but I reckon it will look equally good with some opaque black tights and my new boots. I also managed to sedate my current appetite for shoes by grabbing a new pair of ankle boots. Both previous pairs I had (gold moon boots and red Superman-style affairs) had more holes that Swiss cheese so as painful as it was, it was time to let go. The new pair are far more sturdy, with decent soles, a slight heel and chocolate brown leather – a fr more versatile than pillar box red or gold!